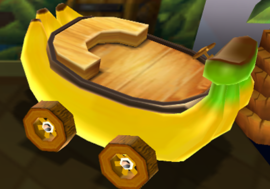 In Mario Party 9, characters collectively drive a vehicle to move through a board. 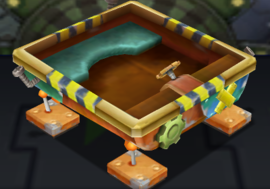 There are three different exclusive vehicles for each stage: one is available by default, while the other two can be unlocked in the Museum for 200 Party Points each. All vehicles share a basic structure with a broad compartment for the characters to stay in, containing seats on the back side and a means of lighting on the frontal side. However, the type of a vehicle depends on the environment of the board in which it is used. The following table lists all vehicles by board (and the corresponding vehicle type). A description is also presented along with each vehicle. Colored sections mark a starter vehicle. Toad Mobile A round car with a vintage appearance, bearing metal bumpers and protruding lights, as well as red seats. Its coachwork is colored red, with white spots in several places, and has black tires. Rickety Ride A car whose components, including the bumpers, tires and coachwork, appear to be made out of wood. The car has a brown overall appearance and green seats. 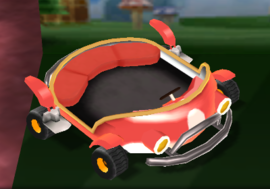 Wiggler Wagon A round car designed after a Wiggler, featuring flower tires as well as two beady eyes and a large nose on the front side. The car also has green seats and a metal bumper on its rear side. Factory Walker A vehicle consisting of a round compartment with a black and yellow rim and two lights on the front side. 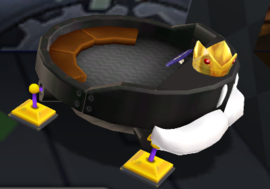 Its feet are circular to reflect the overall shape of the vehicle. Gear Shifter A vehicle with a round compartment that displays gears and metallic patches on its body. The rim contains black and yellow portions on each side. 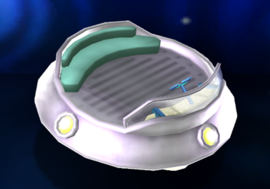 The vehicle's feet are square to reflect its overall shape. King Bob-omb Bus A vehicle designed in the likeness of King Bob-omb. The face and crown are positioned in front of the vehicle. 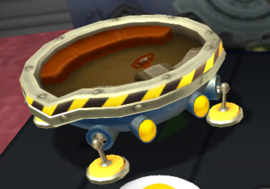 Despite the vehicle being circular overall, it has square feet. 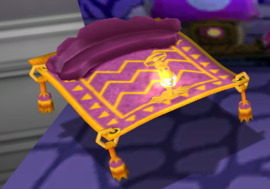 Flying Carpet A generic magic carpet with purple and yellow coloration, as well as tassels hanging from each corner. 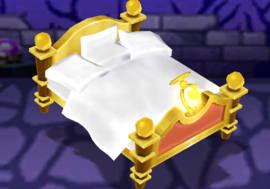 Float Mattress A carrier that resembles a bed with white bedclothes and a golden frame. Boo Blanket A flying blanket inspired by King Boo, with his face imprinted on its surface and his crown serving as the characters' seats. Small crowns are hanging from each corner of the carpet. Sub Baleen A boat that has the appearance of a blue whale, with headlights for eyes and paddles for fins. 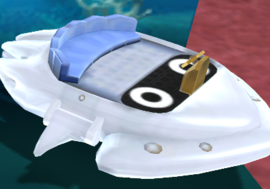 The name of the vehicle is a pun on the words "submarine" and "baleen". 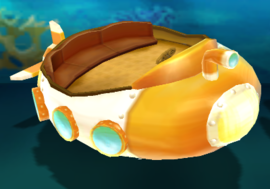 Coral Explorer A boat that resembles a submarine with an orange and white coloration. It has three portholes on each lateral side and a periscope on its frontal side. Blooper Boat A boat that resembles a Blooper lying backside down. Its lateral arms serve as paddles. Shaky Mine Cart A generic mine cart with a wooden body and metal framework. 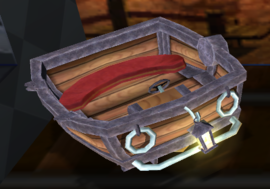 It has two handles and a lantern on the front side, and red seats inside the compartment. Bone Barrow A wagon whose framework consists entirely of bones. 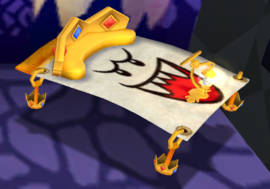 There is also a skull figure on the front side, matching the cranial design of some dragons in the Mario franchise, such as Hooktail and Gobblegut. The inside of the wagon features blue seats. 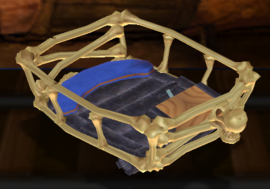 The name of the vehicle is a pun on "bone marrow". Chain Chomp Coupe A Chain Chomp-inspired wagon. It has metallic studs in each corner, bound by chains. 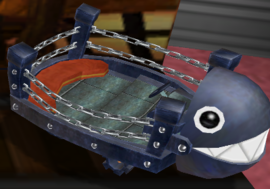 The face of a Chain Chomp is mounted on the front side, while the inside of the wagon features red-colored seats. 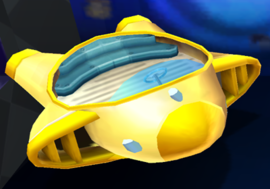 Space Scuttle A yellow starship roughly shaped like a star. Two opposing points represent the engines of the ship, while those in-between represent exhaustion pipes. 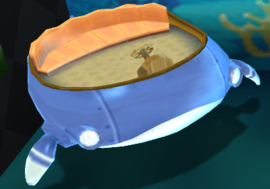 The inside of the Space Scuttle features cyan seats. Shiny Saucer A flying saucer-like vehicle with a lustrous silver appearance. It contains teal seats. Starship Bowser Another flying saucer-like vehicle inspired by Bowser's appearance. 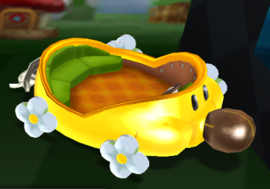 It has a green-colored plated exterior with spikes around it to resemble Bowser's shell. 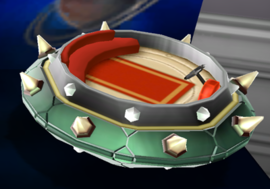 The rim of the cockpit resembles any of Bowser's collars, and the interior features red seats. Barrel Roller A vehicle whose body is designed after a barrel. 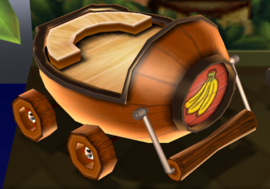 It has wooden wheels and seats and a banana bunch emblem on its frontal side. There is also a large handle in the front. Jungle Junker A vehicle inspired by off-road safari jeeps, with tires for wheels. The coachwork is predominantly brown with a vertical red stripe on the frontal side, while the seats are light-gray. 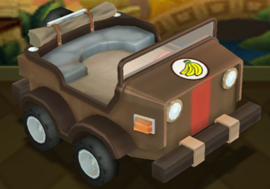 Like the Barrel Roller, the Jungle Junker has a banana bunch emblem on its cowling. There is a spare tire-like object on the back of the car. DK's Banana Slider A vehicle shaped like a banana bunch. 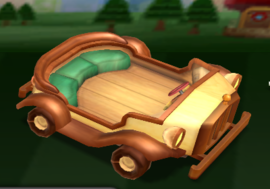 The wheels and the inside of the vehicle, including the seats, appear to be wooden. This page was last edited on January 26, 2019, at 13:32.